Choosing to tint your cars is one of the best favors you do not only for your vehicle but for yourself, as the one who drives it. From preventing its early deterioration to preventing skin cancer, car window tints provide a long stretch of protection for your vehicle and its passengers as well. Deciding when to have your car tinted is also another decision you should think about thoroughly. Many factors are to be considered when picking the right season to do it. If you are going to do it sooner or later, then why not choose to have your car tinted during spring? Tinting during spring is actually advisable. It is usually neither too hot or too cold—the temperature is just enough to ‘cure’ the tints, while the not-so-chilly breeze will not affect the adhesives of the films. However, some areas and regions actually experience rain showers during springtime. Since some of the car tinting installations should be done outdoors, the drizzle might delay the process. The spring is usually a good time in most areas because it is neither too hot or too cold. You may find in some southern areas that humidity can be an issue. Spring can also bring rain and if you are having the windows of your car tinted and it needs to be done outside, that could be a problem. Most customers tend to forget that they need to give their cars an allowance time after tinting before they can use it again. Window tinting takes time to install, but it also takes time to dry out the moisture left in the tint film. It usually takes two to three days to completely cure. 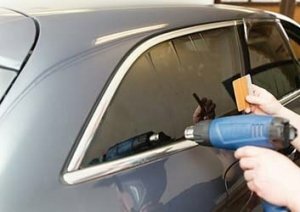 In colder weather, it can take up to several weeks for tint to completely dry. This is why it is more ideal to have your car tinted during spring when the weather is sunnier. It gives the tint a better chance to dry quickly, or at least in a temperature controlled tint shop. More than the desirable weather condition and temperature, tinting your vehicle during the spring can also bring about many benefits for your vehicle, and you as its owner. Window tint films can be used as a retrofit to nearly any window to improve their energy efficiency. By improving the insulating properties of your car windows, it can dramatically improve the passengers’ comfort while inside the vehicle and simultaneously reducing the load on the vehicle’s air conditioning system. The result can be a more comfortable drive with lower fuel consumption. UV rays, heat, and glare from the sun can cause sun damage to your vehicle’s seat cover, wooden, or plastic dashboards. Car window tinting works to block the contributors to fading and extend the life of your vehicle’s interior, which can be damaged by the spring sunlight. Many car owners decide to have their cars tinted for the added elegance and sleekness it will cause. Tints definitely add an aesthetic factor to vehicles, which can contrast the bright days of spring. Moreover, it also provides privacy, which is very important to most drivers and passengers. Although spring temperatures are usually more pleasant than winter temperatures, the mercury can rise and drop abruptly, especially in the early spring. Sometimes spring nights can even dip below freezing, catching spring drivers unprepared for icy roads. Tints act as insulators during colder days, which traps in the warm air inside, and blocks the cold air from entering the vehicle. While anytime is a great time to tint your cars, why not do it sooner? Do it this coming spring and reap its benefits quicker! At the end of the day, the quality of the tinting application boils down to your chosen company. Keep in mind that an experienced tint installer will take your area’s climate into consideration when they are choosing the tint that will best suit your needs. They should be able to take all of these factors into consideration and give you their best recommendations so you will end up with the best result.